A spring flower blossoms on an Allegheny ridge top in eastern West Virginia. Photo courtesy David Sibray. After winter’s passed and before the trees leaf out, the West Virginia forest bursts into a profusion of colorful flowers. No one understood this Appalachian magic better than Earl Core, the naturalist for whom the 100-acre Core Arbortum at West Virginia University is named. Core literally wrote the book on West Virginia plants in 1952 when he co-published “Flora of West Virginia,” though “Spring Wild Flowers of West Virginia” is his best known work, part of which he published in consolidated form in various other publications. Following is one such overview, provided for the West Virginia Heritage Encyclopedia, which we’ve reprinted in part with only slight emendation. In a deciduous forest such as originally covered most of what is now West Virginia the leaves drop from the trees in autumn and the limbs are bare during the winter. Then, in the first month or six weeks of spring, the strengthening sunlight filters through the naked branches, awakening the hundreds of kinds of herbaceous plants, most of which passed their long dormant period buried in the ground in the form of rhizomes, corms, tubers, or bulbs. With an abundance of stored food available, plus a rich soil and plenty of sunlight, the plants grow up quickly, produce their flowers, and ripen their seeds. Among white flowers none surpasses the showy stars of the large-flowered trillium (Trillium grandiflorum), which gleam from forested road borders, easily recognized from a rapidly moving automobile. The plumelily (Smilacina racemosa) is a lily with broad leaves and the many tiny flowers in a plume at the summit of the plant. The bloodroot (Sanguinaria canadensis) has a spotless beauty, its very transitoriness enhancing its charm. The Indians used the red juice of the rootstock as a decoration for skin and clothing. In mountain woods the Canada mayflower (Maianthemum canadense) is a familiar plant, as common in West Virginia as in Canada. The cutleaf toothwort (Dentaria laciniata) decorates the spring woods, beginning in late March. The crisp edible rootstocks are rich in vitamin C.
No flower is better known than the mayapple (Podophyllum peltatum). The curious umbrella-like leaves are most distinctive, more noticeable than the odoriferious flower nodding beneath them. The twinleaf (Jeffersonia diphylla) is named for Thomas Jefferson and is readily recognized by its twin leaves. There are several white violets. The Canada violet (Viola canadensis), up to two feet high, is our tallest violet. The striped violet (V. striata) has the lowest petal striped. The lanceleaf violet (V. lanceolata) differs from other violets in the shape of its leaves. Green flowers are not very numerous, as might be expected. The hellebore (Veratrum viride), called “elleber” by mountaineers, is one of the few. The dingy flowers appear late in May and do not attract as much attention as the broad bright green leaves. The rootstocks are poisonous and are sold as crude drugs. 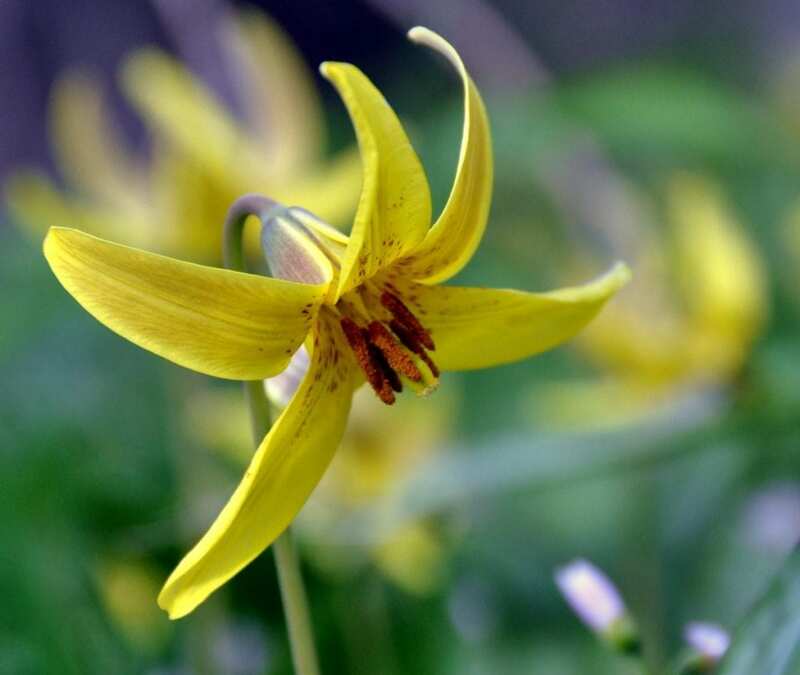 Yellow flowers include the faun lily (Erythronium americanum) which starts to bloom in late March. Other common names are dog’s tooth violet, but it is not a violet, and adder’s tongue. The mottled leaves are noteworthy. The marsh-marigold (Caltha palustris) brightens swampy mountain meadows with a multitude of blooms, so abundant in places it almost seems as if the ground is paved with gold. Country people use the herbage as spring greens. There are a dozen or more kinds of buttercups (Ranunculus acris, etc.) native to West Virginia, some with tiny flowers, others with large, showy flowers. Another name is crowfoot, with reference to the three-divided leaves. Of the two dozen kinds of violets in this state, several are yellow, including the roundleaf violet (Viola rotundifolia), the smooth yellow violet (V. pensylvanica), and the downy violet (V. pubescens). The lousewort (Pedicularis canadensis) growing in open woods and fields throughout the state, received its name from the medieval belief that it caused sheep to have lice. No yellow flower is more abundant or familiar than the dandelion (Taraxacum officinale). The jagged leaves suggest the name, a corruption of the French “dent de lion” (tooth of lion), and are eaten as spring greens. The feathery-tufted seed balls, beloved by children, are delicately and beautifully adapted to wind dispersal. Among pink flowers, one of the most familiar is the spring beauty (Claytonia virginica). The Latin name memorializes John Clayton, the first Virginia botanist. The wild pink (Silene pensylvanica) adorns shale barren slopes east of the Alleghenies and is seldom seen elsewhere in the State. The wild geranium (Geranium maculatum) brightens open woods and shaded roadsides with fairly large pink-purple flowers, from late spring into early summer. The pink lady’s-slipper (Cypripedium acaule), or moccasin flower, is a blossom whose beauty never wanes. The unusual shape of the flower, its graceful beauty, and its secluded habitat combine to give it a special place. Red flowers add a touch of brilliance to the spring woods. The wake-robin, or red trillium (Trillium erectum) is one of the familiar flowers of rich spring woods. Wake-robin, pretty and suggestive though the name is, hardly is appropriate for the flower, since it appears late in April, when robins have been around for quite a while. Another common name is ill-scented trillium; someone has suggested that the flower smells like a wet dog. The fire pink (Silene virginica) decorates dry open woodlands, and is particularly abundant in the hilly region of the State from the Alleghenies westward. Its stems are covered with sticky hairs to which tiny insects may become attached, suggesting another common name, catchfly. Blue flowers integrade into purple or red and apparently attract different insects from those which visit white or yellow flowers. Dwarf larkspur (Delphinium tricorne) is common in rich woods throughout the State and attracts attention from the unusual shape of the flowers as well as their rich color. There are many individuals and many species of blue violets, including the common blue violet (Viola papilionacea). They are among the best known as well as the best-loved of all the spring flowers. Under the name johnny-jump-ups children gather them in bouquets, may play games with them by hooking their heads together. Picking the flowers is not as serious with violets as it is with most plants, since seeds are often produced in small and inconspicuous self-pollinating flowers, which never open and are usually found near or even within the soil. The wild blue phlox (Phlox divaricata) is a graceful, delicately tinted flower of rocky woods. The name phlox is from the Greek word for flame and the color varies, as does a flame, from pink to purple to blue. In many parts of the state the commonest flower of moist rich woods is the Virginia cowslip or bluebells (Mertensia virginica). The drooping porcelain-blue flowers start out pink, then change to blue as they unfold. Rarely they may remain pink, or sometimes they are pure white. No flower-lover can forget the loveliness of the bluets (Houstonia caerulea). Roadsides, fields, even lawns, are often thickly carpeted with the dainty enamel-like blossoms, often in such profusion as to suggest a light, late-spring snowfall. The tiny speedwells (Veronica) have pale blue flowers, or white streaked with blue. The Latin name honors Saint Veronica, who is said to have loaned her handkerchief to Christ to wipe his face on the way to crucifixion, whereupon the handkerchief ever afterwards bore the true image, vera ikon, of his face. By early May the leaves on the trees have begun to unfold and conditions are rapidly changing. Around the tenth of May, when “oak leaves are as big as squirrels’ ears.” is the traditional corn-panting time. By the end of May most of the beautiful spring flower garden has disappeared and there begins to be a temporary scarcity of wild flowers. Summer is at hand!